Click an image below to see the associated product. 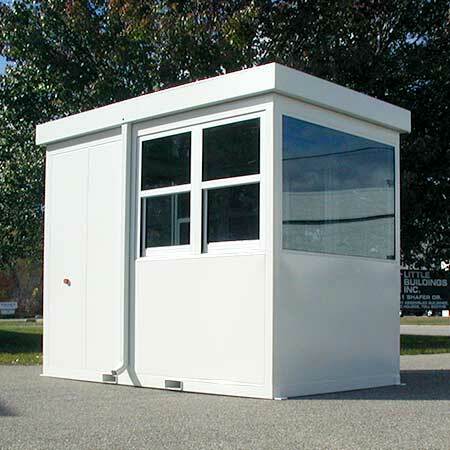 Little Buildings factory assembled Cashier Booths, portable parking booths, Parking Attendant Booth, Parking Booths, and Portable Steel Cashier Booth are available as standard models or we can custom build our product to fit your needs at a competitive price. We have portable steel cashier booths for sale of all shapes and sizes! 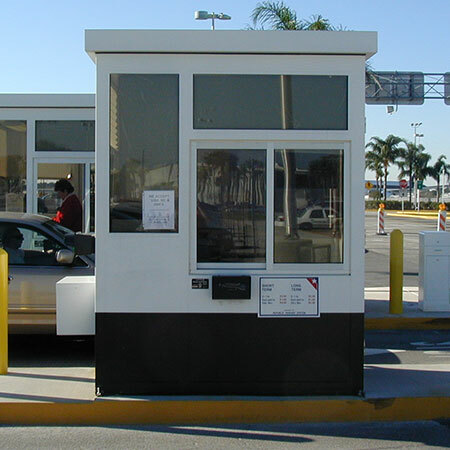 While there is no such thing as a 'bullet proof cashier booth' or 'bullet proof parking booth' we do offer bullet resisting parking booth and Parking lot Cashier Booths that can resist the most common weapons listed by Underwriters Laboratories 752 (ask your sales consultant for a copy of the UL threat levels). Standard buildings are ruggedly built with welded galvanized steel construction for years of tough service. Parking booths, portable steel parking booths, Cashier Booth, and Cashier Booths from Little Buildings feature welded galvanized steel construction, clear tempered safety glass windows, cashier window, sliding door, work counter with storage drawer, 4" elevated base, treadplate floor, insulated walls and ceilings, and long lasting two-part polyurethane paint finish in choice of color. parking booth standard electrical features are fluorescent light with diffuser lens and wall switch, wall mounted electric heater with integral thermostat, electrical outlet with ground fault protection, and all wiring to a wall mounted circuit breaker box with main disconnect. 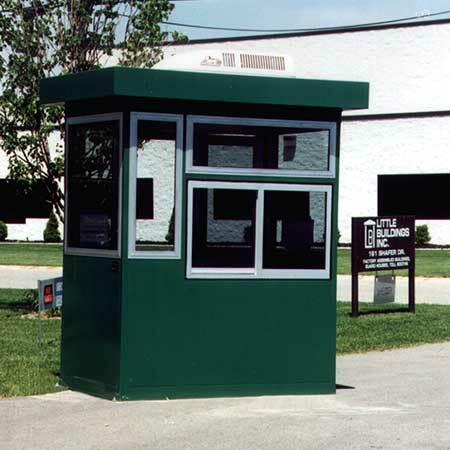 Portable Parking Booth, Portable Steel Parking Booths and Cashier Booths optional features include locking cash drawers, additional cashier windows in doors or walls, blank out window areas for equipment mounting, floor safes, and anti-fatigue mat or rubber tile flooring. Parking Booth electric options include roof or wall mounted air conditioners, exterior lighting, surge suppressors for sensitive parking or revenue equipment, dimming or task lighting for extended night operations, and many more too numerous to list. Contact a Little Buildings parking booth or portable steel parking booth sales professional to develop your next parking booth! We welcome the opportunity to work with you! What does your parking booth / Cashier Booth include? You get a lot for your investment from Little Buildings such as: FRAMING: 2"x2"x.083" (min.) galvanized steel tubing frame mig welded for the ultimate in Cashier Booth strength and longevity. FLOOR: 4-way treadplate welded to base. BASE: 4"x2"x.083 (min.) galvanized steel tubing mitred and mig welded. GLAZING: Clear tempered safety glass throughout (tinted and insulated optional). 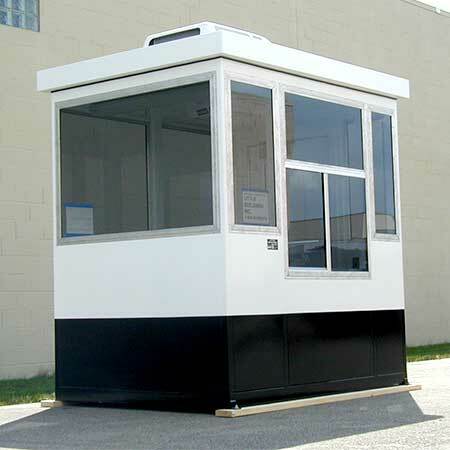 Sliding parking booth and cashier booth windows available as option to make your portable steel Cashier booth a drive-up type. CANOPY: 3" overhang is standard with a downspout. Made of 14 ga. galvanized steel for long service. Larger overhangs available. COUNTER: 14ga. galvanized steel counter with storage drawer beneath. Optional stainless steel or plastic laminate top. Locking cash drawer available. OUTSIDE WALLS: 14ga. galvanized steel press formed and mig welded to frame and base for maximum strength. INSULATION: Walls have 2" rigid fiberglass insulation, roof box fully insulated with 4" minimum insulation. INSIDE WALLS: 18ga. galvanized steel mig welded to frame and base. CEILING: formed panels of 14ga. galvanized steel welded to roof box ROOF BOX: 4"x2"x.083 (min.) galvanized steel tubing mitred and mig welded. Sloped roof is hidden by the canopy fascia. DOOR: Sliding aluminum (steel optional) door with overhead track and ball bearing hangers. Lock is maximum security hookbolt type with key cylinder and thumb turn inside. Commercial aluminum threshold, weatherstrip and safety glazing included. We can include a transaction window in the door of your parking booth Portable Steel Cashier Booths and Cashier Booths from Little Buildings, Inc. can be ordered in the Colonial Series© (recessed panels, standing seam roof) or Panorama Series© (glass to glass corners) as well as with ready to brick exteriors. cashier booths Bullet resistant are available for higher risk areas. If you are looking for a cashier booth for sale, contact us directly by email info@littlebuildingsinc.com or call us toll free to speak to a cashier booth specialist 1-888-55-BOOTH (1-888-552-6684)or 1-586-752-7100. Little Buildings, Inc. reserves the right to improve or modify its products without notice. Photographs shown may show optional equipment and features not included on standard building. Please request a sketch for approval when ordering your new Little Building cashier booth, or portable steel cashier booth.